Contains 9 different pieces of superb quality Carp Fishing luggage Our normal price if you bought all these items separately is considerably more, hence this represents a massive saving on our already super low prices. Remember this is top quality kit built to the same standards as the most expensive brands – built to last! Bundle consists of the following items. Cyprinus 12ft 3+3 Carp fishing rod carryall holdall luggage case bag sleeve. Cyprinus 12ft Carp Fishing Padded Rod Bag Sleeve For Made Up Rods. 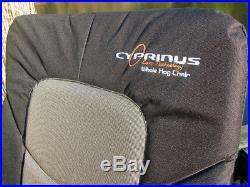 Cyprinus 13ft Carp Fishing Padded Rod Bag Sleeve For Made Up Rods. Cyprinus Carp Fishing Stalking Shoulder Tackle Bag. 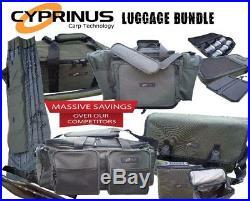 Cyprinus Carp Fishing XL Extra Large Carryall Bag storage holdall Luggage. Cyprinus Deluxe Carp Fishing Insulated Tackle Food Cool Bag Carryall Boilie. Cyprinus Glug Bag With 6 Glug Pots Clear Fronted Carp Fishing Boilies Bait. Cyprinus High-Quality Carp Fishing Stiff Rig Wallet With 20 Pins Large & Regular. 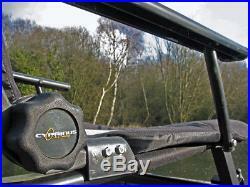 Cyprinus Standard Session Cool cooler Bag Luggage Carp Fishing Baits Food etc. Follow the simple instructions and we will process your order. Before you complete the checkout, please take the opportunity to look around the store as other great value items can be added to your shopping basket. If for any reason you do not complete checkout we will not get your order. This means that your item will take considerably longer to arrive. This also has a link to pay for the item. Please leave your feedback upon receiving the item and we will reciprocate. Prices Prices are quoted in Pounds Sterling. And we will work with you to resolve it to your satisfaction. We package all our items carefully to ensure they arrive safely. However please note there may be a surcharge to the Highlands and Islands. Please message us if you have any questions regarding this. Please check your item listing to check otherwise. We mark all our items as dispatched once they are packed. Occasionally things do go missing in the post, or can be delayed. This is to allow for the fact that you did not have the chance to peruse the item as you would in a shop. We will, subject to availability, replace the item immediately upon receipt. We will arrange to collect the faulty item/s from you. All services performed by us will be performed with all due skill and care. Guarantees We warrantee and represent that the goods are as described in the above listing. We specifically disclaim any implied warranties of title, merchantability, fitness for a particular purpose and non-infringement. Customers should satisfy themselves that any item choice made is suitable for their intended purpose or use. We pride ourselves on our customer service. Liability Tackle Discounts believes the information on this page to be accurate; such information is subject to change without notice. We are not responsible for any inadvertent errors. We take every precaution to ensure that our listings are as accurate and informative as possible. We are always more than happy to help. Telephone: 0845 299 0602. Parcel Force customer services/tracking – 08448 004466. DPD customer services/tracking – 08445 560 560. General Terms and Conditions. Before we get started please note that by using this store and purchasing our products or services it means that you agree to our terms and conditions. So as to protect your own interests please read the conditions carefully before ordering. Tackle Discounts may decide to terminate this agreement if a user is at fault. Tackle Discounts does not act or have rights to act as an agent for the consumer or any other person. If any provision of these terms and conditions are not enforced by SKU it does not constitute a continuing waiver. If any of these terms is held to be unenforceable, the remainder of the provisions will remain in force and effect. These terms replace any and all previous terms and conditions and constitute the full agreement between SKU and its users. These terms should be read in conjunction with all other headings, subjects, points and clauses in our Help section, all these headings, their subject matter, points and clauses form part of these terms and conditions. We cannot guarantee that these terms and conditions accord with local laws of other countries outside the UK and EU/EC. Our Rights We reserve the right to: Temporarily or permanently we may modify or withdraw, the Website (or any part of) with or without notice and you confirm that we shall not be liable to you or any third party for any modification to or withdrawal of the website; and/or We may change these conditions from time to time and your continuing use of the web site (or part of it) after the change shall be deemed your acceptance of such change. It is your responsibility to check regularly to determine whether the Conditions have been changed. If you do not agree to any change to the Conditions then should stop using the Website. We will use our reasonable endeavours to maintain the Website. The Website is subject to change from time to time. You will not be eligible for any compensation because you cannot use any part of the Website or because of a failure, suspension or withdrawal of all or part of the Website due to circumstances beyond our control. Your Data We respect your personal information and undertake to comply with applicable UK Data Protection legislation from time to time in place. You should be aware that: If we are requested by the police or any regulatory or government authority investigating suspected illegal activities, or upon receipt of a court order, to provide your Personal Information and/or information concerning your activities whilst using the Website we shall do so; and We reserve the right in our reasonable discretion to disclose details of your use of the Website in relation to any, or any threatened, Court Proceedings in connection with your use, or the use of anyone under your control, of the Website whether in connection with the matters set out in these Conditions or otherwise. You are permitted to use this material only as expressly authorised by us. Entire Agreement These Conditions (as amended from time to time) contain the entire agreement between you and us relating to the subject matter covered and supersede any previous agreements, arrangements, undertakings or proposals, written or oral, between you and us in relation to such matters. No oral explanation or oral information given by either of us shall alter the interpretation of these Conditions. You confirm that, in agreeing to accept these Conditions, you have not relied on any representation save insofar as the same has expressly been made a representation in these Conditions and you agree that you shall have no remedy in respect of any misrepresentation which has not become a term of these Conditions save that your agreement contained in this Clause shall not apply in respect of any fraudulent misrepresentation whether or not such has become a term of these Conditions. Law The Conditions will be exclusively governed by and construed in accordance with the laws of United Kingdom whose Courts will have exclusive jurisdiction in any dispute, save that we have the right, at our sole discretion, to commence and pursue proceedings in alternative jurisdictions. The item “Cyprinus Carp Luggage Bag Rig Wallet, Cool Bag, Quiver Rod Holders, Carryall Kit” is in sale since Monday, January 8, 2018. This item is in the category “Sporting Goods\Fishing\Anglers’ Equipment\Tackle Boxes & Bags”. The seller is “tacklediscounts” and is located in Swindon. This item can be shipped to United Kingdom, Austria, Belgium, Bulgaria, Croatia, Cyprus, Czech republic, Denmark, Estonia, Finland, France, Germany, Greece, Hungary, Ireland, Italy, Latvia, Lithuania, Luxembourg, Malta, Netherlands, Poland, Portugal, Romania, Slovakia, Slovenia, Spain, Sweden, Australia, United States, Canada, Brazil, Japan, China, Israel, Hong Kong, Norway, Indonesia, Malaysia, Mexico, Singapore, South Korea, Switzerland, Taiwan, Thailand, Saudi arabia, South africa, United arab emirates, Ukraine, Chile. Remember, unlike some other chairs on the market, this chair comes complete with the rod pod (feeder arm) and the side table. The’Whole Hog Chair’ is as the name suggests a complete fishing system, in terms of comfort and practicality, with a new complete accessory system tailor-made for the chair to cover every situation. The Whole Hog is the perfect Chair, whether on commercial carp fisheries, Barbel fishing on the river or float fishing for any species. Fully adjustable legs and solid frame form a rock solid fishing station The robust square aluminum framed chair is upholstered in a hard-wearing material that is comfortably padded. 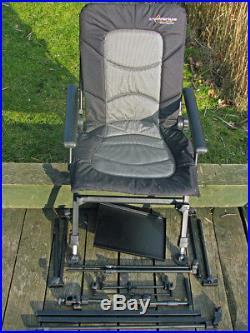 It features fully extending legs with moveable mudfeet, and an easily adjustable back rest. All the cleverly designed accessories have a single clamp and linking arm section that fits onto the accessory bars, making it easy to tailor the layout to your individual needs. The only chair on the market that comes complete with all the accessories including a bait table, extendable and adjustable feeder arm, Two Buzz bars, and 4 ultra grip rubber rod rests. The whole package also comes in an extra tough carry bag with internal pocket for all the attachments and 2 padded carry handles. 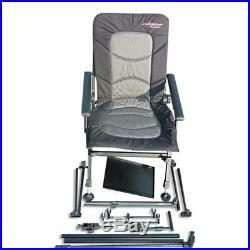 Fully adjustable and lockable padded back rest with quality locking mechanism. Strong yet lightweight coated frame. Fully padded mattress made from high grade and stylish material. Fully adjustable legs extending an extra 15cm giving the total leg height of up to 40cm Max. Total stability on any terrain. Non slip leg locking system. Wide arms for extra support. Easy adjust accessory arms. Fully adjustable feeder arm. 2 x Two rod adjustable Buzz bars. 4 x Supergrip rubber rod rests. Tough, padded carry bag with internal pocket for all accessories. 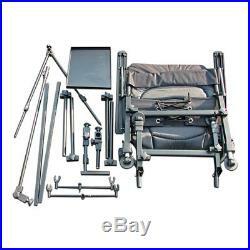 DIMENSIONS Seat Width 58cm x Back Height 60cm Fully dismantled in carry bag 19cm x 65cm x 18cm. Follow the simple instructions and we will process your order. Before you complete the checkout, please take the opportunity to look around the store as other great value items can be added to your shopping basket. If for any reason you do not complete checkout we will not get your order. This means that your item will take considerably longer to arrive. This also has a link to pay for the item. Please leave your feedback upon receiving the item and we will reciprocate. Prices Prices are quoted in Pounds Sterling. And we will work with you to resolve it to your satisfaction. We package all our items carefully to ensure they arrive safely. However please note there may be a surcharge to the Highlands and Islands. Please message us if you have any questions regarding this. Please check your item listing to check otherwise. We mark all our items as dispatched once they are packed. Occasionally things do go missing in the post, or can be delayed. This is to allow for the fact that you did not have the chance to peruse the item as you would in a shop. We will, subject to availability, replace the item immediately upon receipt. We will arrange to collect the faulty item/s from you. All services performed by us will be performed with all due skill and care. Guarantees We warrantee and represent that the goods are as described in the above listing. We specifically disclaim any implied warranties of title, merchantability, fitness for a particular purpose and non-infringement. Customers should satisfy themselves that any item choice made is suitable for their intended purpose or use. We pride ourselves on our customer service. Liability Tackle Discounts believes the information on this page to be accurate; such information is subject to change without notice. We are not responsible for any inadvertent errors. We take every precaution to ensure that our listings are as accurate and informative as possible. We are always more than happy to help. Telephone: 0845 299 0602. Parcel Force customer services/tracking – 08448 004466. DPD customer services/tracking – 08445 560 560. General Terms and Conditions. Before we get started please note that by using this store and purchasing our products or services it means that you agree to our terms and conditions. So as to protect your own interests please read the conditions carefully before ordering. Tackle Discounts may decide to terminate this agreement if a user is at fault. Tackle Discounts does not act or have rights to act as an agent for the consumer or any other person. If any provision of these terms and conditions are not enforced by SKU it does not constitute a continuing waiver. If any of these terms is held to be unenforceable, the remainder of the provisions will remain in force and effect. These terms replace any and all previous terms and conditions and constitute the full agreement between SKU and its users. These terms should be read in conjunction with all other headings, subjects, points and clauses in our Help section, all these headings, their subject matter, points and clauses form part of these terms and conditions. We cannot guarantee that these terms and conditions accord with local laws of other countries outside the UK and EU/EC. Our Rights We reserve the right to: Temporarily or permanently we may modify or withdraw, the Website (or any part of) with or without notice and you confirm that we shall not be liable to you or any third party for any modification to or withdrawal of the website; and/or We may change these conditions from time to time and your continuing use of the web site (or part of it) after the change shall be deemed your acceptance of such change. It is your responsibility to check regularly to determine whether the Conditions have been changed. If you do not agree to any change to the Conditions then should stop using the Website. We will use our reasonable endeavours to maintain the Website. The Website is subject to change from time to time. You will not be eligible for any compensation because you cannot use any part of the Website or because of a failure, suspension or withdrawal of all or part of the Website due to circumstances beyond our control. Your Data We respect your personal information and undertake to comply with applicable UK Data Protection legislation from time to time in place. You should be aware that: If we are requested by the police or any regulatory or government authority investigating suspected illegal activities, or upon receipt of a court order, to provide your Personal Information and/or information concerning your activities whilst using the Website we shall do so; and We reserve the right in our reasonable discretion to disclose details of your use of the Website in relation to any, or any threatened, Court Proceedings in connection with your use, or the use of anyone under your control, of the Website whether in connection with the matters set out in these Conditions or otherwise. You are permitted to use this material only as expressly authorised by us. Entire Agreement These Conditions (as amended from time to time) contain the entire agreement between you and us relating to the subject matter covered and supersede any previous agreements, arrangements, undertakings or proposals, written or oral, between you and us in relation to such matters. No oral explanation or oral information given by either of us shall alter the interpretation of these Conditions. You confirm that, in agreeing to accept these Conditions, you have not relied on any representation save insofar as the same has expressly been made a representation in these Conditions and you agree that you shall have no remedy in respect of any misrepresentation which has not become a term of these Conditions save that your agreement contained in this Clause shall not apply in respect of any fraudulent misrepresentation whether or not such has become a term of these Conditions. Law The Conditions will be exclusively governed by and construed in accordance with the laws of United Kingdom whose Courts will have exclusive jurisdiction in any dispute, save that we have the right, at our sole discretion, to commence and pursue proceedings in alternative jurisdictions. 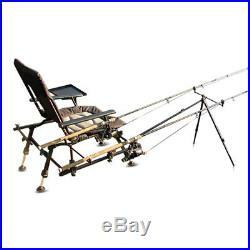 The item “Cyprinus fishing chair with rod holder rod rest side tray as in picture” is in sale since Friday, November 17, 2017. 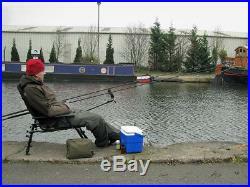 This item is in the category “Sporting Goods\Fishing\Anglers’ Equipment\Chairs & Bed Chairs”. The seller is “tacklediscounts” and is located in Swindon. This item can be shipped to United Kingdom, Austria, Belgium, Bulgaria, Croatia, Cyprus, Czech republic, Denmark, Estonia, Finland, France, Germany, Greece, Hungary, Ireland, Italy, Latvia, Lithuania, Luxembourg, Malta, Netherlands, Poland, Portugal, Romania, Slovakia, Slovenia, Spain, Sweden, Australia, United States, Canada, Brazil, Japan, China, Israel, Hong Kong, Norway, Indonesia, Malaysia, Mexico, Singapore, South Korea, Switzerland, Taiwan, Thailand, Chile.